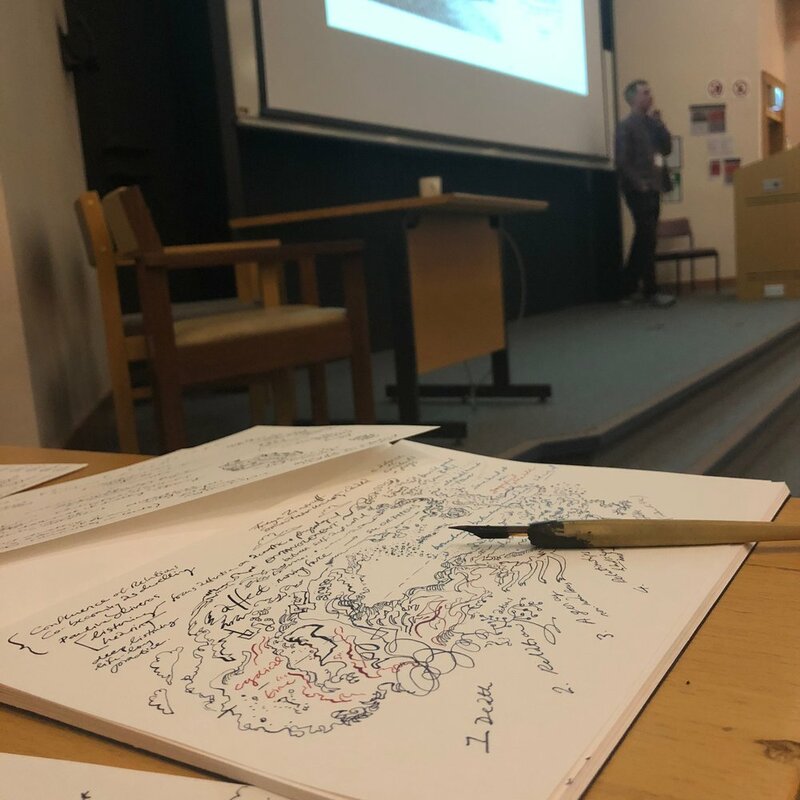 Illustrated lecture notes from the Royal Geographical Society’s annual conference at Cardiff University, 31 August; two sessions on ‘Landscape, Being and Time’, convened by Prof Owain Jones (Bath Spa University) and Dr. Daniel Keech (University of Gloucestershire). Adding tone to line drawings made on site. Colleague and creative collaborator Richard Parry (Coleridge in Wales), was invited to give a paper with Dr. Russell Re Manning (Bath Spa) on Landscapes of Faith. 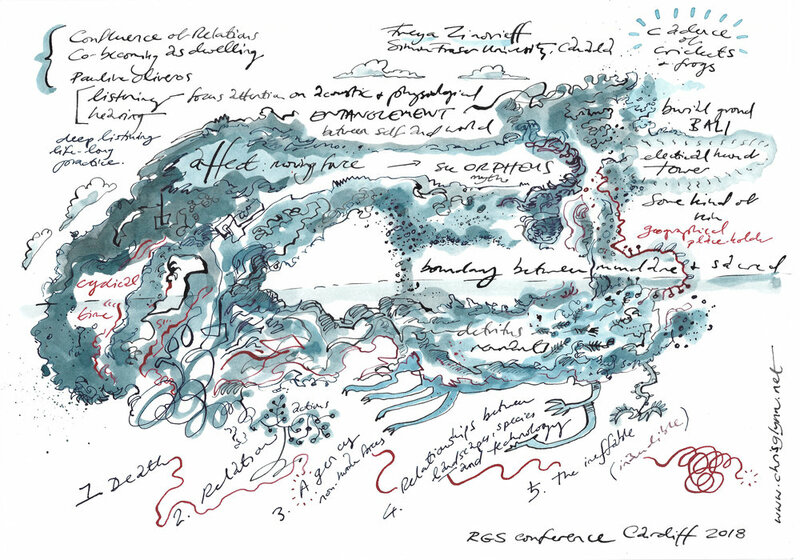 Papers wove around Heidegger’s concept of dwelling, and the idea of human entanglement - with fields, other species, minerals, narratives and networks - which prompted some bucolic pen and ink meandering and 'agriscopic' doodles. The sessions offered many unfamiliar threads to follow, especially on music and sound. Freya Zinovieff (Simon Fraser) presented a confluence of natural and mechanical sounds, while Jenny Hall (York St.John) explored the 'absolute auterity' provided by mountain silence. Richard Parry’s singing Aros Mae’r Mynyddoedd Mawr (Ceiriog/Meirion Williams) and reading of a John Berger meditation on the power of song (Confabulations, 2016) folded the discussion into other ways of dwelling in landscape and sound. The conference attracted a record number of delegates to Cardiff University, covering many territories and -scapes. I look forward to sketching out further conversational structures between Human Geography and Illustration research/practice. A new space charting independent projects from September 2018 running alongside my part-time role as Senior Lecturer in Illustration at Cardiff School of Art & Design. This blog will include new drawings, publications, facilitation, performance and composition work. See also: Parry & Glynn (www.parryandglynn.net) for antemasque and carnival work.